A federal judge on Wednesday blocked most of a controversial Arizona immigration law just hours before it was to take effect, handing the Obama administration a win in the first stage of a legal battle expected to end up in the U.S. Supreme Court. U.S. District Court Judge Susan Bolton in Phoenix issued a temporary injunction against parts of the law that would require police to determine the status of people they lawfully stopped and suspected were in the country illegally. Bolton also forbade Arizona from making it a state crime to not carry immigration documents, and struck down two other provisions as an unconstitutional attempt by Arizona to undermine the federal government’s efforts to enforce immigration policy. There’s an interesting article on pioneer filmmaker Oscar Micheaux in the Rapid City Journal this week. There’s also an accompaning photo of and interview with Jerry Wilske, director of the Oscar Micheaux Center in Gregory, South Dakota, and who spoke on Oscar Micheaux at the 2009 Western Literature Association conference. Troy Sundquist and I tramped through knee-high grass to get to the old homestead site, where a ramshackle cabin and barn remain. Video of The Lusty Men (1952), discussed in Neil Campbell’s post below, is difficult to come by. I’ve located a couple of clips on the Turner Classic Movies website. Just click on the links below to go the clips. If the link doesn’t work, try copying the link http://www.tcm.com/mediaroom/index.jsp?cid=332248 and pasting in your browser. The editor of 30-40 Years West of Here: Stories from the Sub-Rural West invites contributions for a collection of creative nonfiction essays that explores the implications of living in that often overlooked space/time specific to the West of the 60s, 70s, and early 80s. Partly the result of demographic patterns tied to economic booms and busts, these oddly anachronistic and often isolated neighborhoods sprung up in areas somewhat removed from the nearest towns and adjacent to and/or surrounded by woods, farms, foothills, rivers, and streams. Not part of the Old West or the New, this time/space presented those who lived, worked and played in those eras/areas of the sub-rural West with historically unique and significant experiences. To be sure, vestiges of this particular “West” remain visible—though somewhat hidden in many cases—in cities such as Salt Lake, Boise, Boulder, Spokane, Yakima, Denver, Reno, Rapid City, and Bozeman (and, some would suggest, the formerly sub-rural suburbs of Midwestern cities such as Minneapolis and St. Paul). Where new, carefully planned suburbs packed with earth-tone houses and manicured lawns have filled in the open areas that once separated the relatively small, scattered neighborhoods and isolated, single streets, one can still find split-level houses, half-acre yards, solitary horses, and the inevitable detritus that accrues over time in big yards near small garages. Eliding categories such as “Old West” and “New West,” these “neighborhood” are seldom studied critically or recaptured creatively, which is where you come in. This proposed collection calls for essays from various critical and creative vantage points that return readers to this time/space and thus shed light on its lasting significance. scholarship has addressed the rise of oil as a cultural problem. life in the United States and beyond. and cv should be sent as Word documents or PDFs. words, and should be accompanied by a short abstract (200-300 words). Arizona is home to several world-class tourist destinations you won’t want to miss while you are here for WLA’s 45th annual conference. I am pleased to announce two opportunities to visit the Grand Canyon state’s unique natural and cultural treasures. Both trips are scheduled to depart from the Prescott Resort at approximately 12:30 pm on Saturday, October 23rd. You will travel roundtrip on Shuttle U’s comfortable 13-seater vans with professional drivers. You may sign up when the registration page becomes available near the end of July. 1. 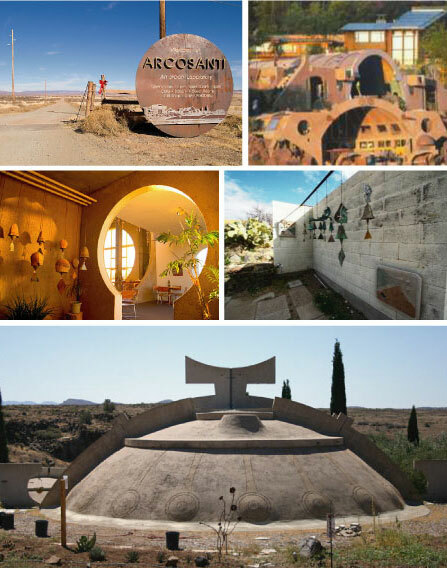 Arcosanti is an experimental town in the high desert of Arizona. Built according to architect Paolo Soleri’s theory of “arcology,” (architecture + ecology) Arcosanti is a living example of sustainable community. You will take a 45-minute drive to the beautiful urban laboratory, be greeted there with a tour of the extensive, fascinating grounds, and have the opportunity to eat at the café and experience this amazing place on your own. This trip will return to the conference hotel by about 5:30. $35 per person. 2. Grand Canyon Village, a 90-minute drive from Prescott, is located on the south rim of the Grand Canyon. Your driver will stop first at Hermit’s Rest, architect Mary Colter’s 1914 canyon-side masterpiece. Look for other Colter buildings as you stroll the rim of the majestic canyon. This field trip allows you enough time to eat at the one the rim’s fine restaurants and catch a breathtaking sunset before leaving the canyon at about 7:00pm. $45 per person.